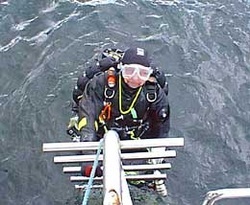 A party of 12 Divers from Hull drove the 450 miles to the Lochaline Dive Centre, to dive the wrecks of Mull. The weather was generally very good, and some cracking dives were done. Visibility was 3 to 4 metres in the Sound but better around the far side of the Island. The most notable dive was that of the Aurania, a Cunard Liner. She was torpedoed by a German U-boat on 4 February 1918, off the coast of Ireland and sank in the Mull whilst being towed to the Clyde for repair. Though very broken up, the site is littered with shards of pottery and some intact bottles. The Tapti is another excellent "rummage" dive, and far more intact than the Aurania. It went down in 1951 after running aground. Although broken up there are many swim throughs, such as the prop shaft tunnel and a large area of "Heads" where much broken porcelain can be found from wc's and wash basins. Everyone had a good time, and I would highly recommend the dive centre and the co-operative they operate with local boat skippers. This trip coincided with another annual event, the St Abbs trip. On the plus side the club had about 34 divers away in the one weekend. On the down side some would have liked to do both trips.